Definition at line 51 of file llscrollingpanellist.h. Definition at line 54 of file llscrollingpanellist.h. Definition at line 49 of file llscrollingpanellist.cpp. 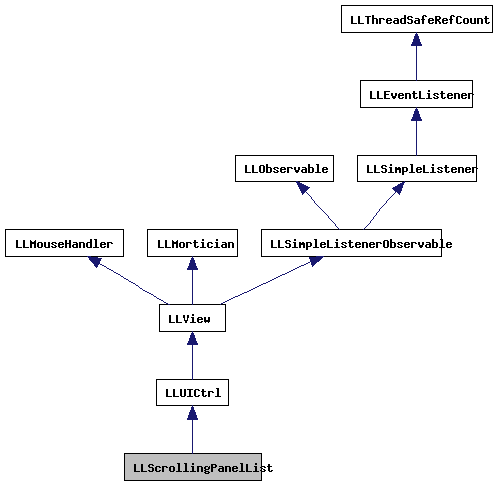 References LLView::addChildAtEnd(), FALSE, llmax(), mPanelList, LLView::reshape(), and S32. Definition at line 42 of file llscrollingpanellist.cpp. References LLView::deleteAllChildren(), FALSE, mPanelList, and LLView::reshape(). Referenced by LLFloaterCustomize::clearScrollingPanelList(), and LLFloaterCustomize::generateVisualParamHints(). Definition at line 144 of file llscrollingpanellist.cpp. References LLView::draw(), LLView::getVisible(), and updatePanelVisiblilty(). Definition at line 155 of file llscrollingpanellist.cpp. References LLView::createRect(), LLUICtrl::initFromXML(), and LLScrollingPanelList(). Definition at line 139 of file llscrollingpanellist.cpp. Definition at line 134 of file llscrollingpanellist.cpp. Definition at line 169 of file llscrollingpanellist.cpp. Definition at line 129 of file llscrollingpanellist.cpp. Definition at line 82 of file llscrollingpanellist.cpp. Definition at line 92 of file llscrollingpanellist.cpp. References BORDER_WIDTH, LLRectBase< Type >::getHeight(), LLView::getParent(), LLView::getRect(), LLRectBase< Type >::getWidth(), LLView::localPointToScreen(), LLRectBase< Type >::mBottom, LLRectBase< Type >::mLeft, mPanelList, LLRectBase< Type >::mRight, LLRectBase< Type >::mTop, S32, and LLRectBase< Type >::stretch(). Definition at line 75 of file llscrollingpanellist.h. Referenced by addPanel(), clearPanels(), updatePanels(), and updatePanelVisiblilty().